The fifth installment in the first season of the Showtime series The Borgias contained some interesting moments, some of them resonating in the historical record, others not. We take a trip back to Florence and get another glimpse of Savonarola, and travel north to Milan to visit the infamous Ludovico Sforza. The art historical references are short and sharp, and a little less obvious than in previous episodes, but are an interesting challenge for Renaissance art and history fans keenly following the show. The story arc following della Rovere has taken some fantastical turns, but is now starting to track back into the realm of history, as we learn he is facilitating passage for French forces into Italy. It is here I must mention a superb resource for those wanting an intricate history of the political machinations of the era. Kenneth Meyer Setton's The Papacy and The Levant 1204-1571 is the resource many of more well known modern volumes on the Borgia derived their references from. It is a rare volume to find a physical copy of, but sections of it are available online via Google Books. The second volume focuses on the 15th Century, and is the most relevant to the era depicted in the show. As Setton tells us, Cardinal della Rovere did not run immediately to Naples, Florence or Milan as shown in the series. It was not until June of 1494, after the coronation of Alfonso II of Naples that Giuliano's travels became more frantic. He first retreated to his stronghold at Ostia, went for a short time to Genoa and then proceeded to Avignon, French King Charles VIII's headquarters. Plans that were made on behalf of Charles VIII and della Rovere were committed by agents, not della Rovere himself hotfooting it around Italy. "He would reduce us to his own status...a pile of straw on a monastery floor. He disapproves of display, ornament, artistry...even comfort." "You would do a good deed if you erased those figures of yours painted to resemble immoral women...You show the Virgin Mary dressed like a prostitute. Now indeed is the worship of God destroyed!" This quote is taken from Savonarola's 18th Sermon on Amos, 1496. It is of course 3 years ahead of the setting of this episode, so we may still see some reference to this issue in a future episode. The scenes where the brutish Giovanni Sforza repeatedly forces himself on Lucrezia are becoming harder to watch. We must remind ourselves that Lucrezia was still 13 years of age at this point in time, and even by the standards of the day, was considered young as far as the consummation of the marriage was concerned. The writers of the show are most definitely siding with the Sforza account as to whether the marriage of was consummated. Holliday Grainger is doing a magnificent job at maintaining a degree of Lucrezia's innocence whilst slowly becoming aware of the great forces pulling at her from many directions. Elements of the writing here are very good, such as Lucrezia's mild domineering of Paolo the stable boy - her repeated requests for him to say her name are the types of behaviours victims of abuse can display. With the help of Paolo, Lucrezia arranges for her unpleasant spouse to have a riding accident, providing her with some respite from his advances. This was the first episode where there is no communication between Cesare and his sister, due to their physical distance apart, and that Cesare is in pursuit of Ursula Bonadeo, another woman with an unpleasant husband. For those that have asked, there is no record of Ursula as Cesare's lover. We do have a name for a courtesan he spent time with, but not the wife of a condottiero(mercenary) named Bonadeo. This arc in the story seems to be a fiction to keep Cesare occupied while Lucrezia is away, as well as demonstrate Cesare's popularity with the ladies, of which there are descriptions of in the record. As della Rovere makes his trek to Milan, we are introduced to another famous Renaissance despot, Ludovico Sforza, also known as Il Moro(The Moor). In some more historical unpleasantness taken straight from the Burckhardt's imaginative Civilisation of Renaissance Italy, we see Ludovico keeping his nephew, Gian Galeazzo as prisoner. By the end of the episode Gian Galeazzo is dead via poison, echoing popular opinion at the time, and accounts by historians such as Franscesco Guicciardini. 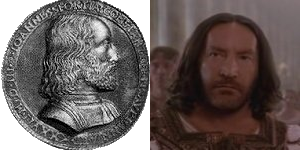 Although dates have not been openly clarified in the show, the events of this episode suggest it is still in 1493, though Gian Galeazzo's death is recorded in 1494. Modern scholars subscribe to the tales of imprisonment and poisoning far less. Although none have been able to produce irrefutable evidence of Gian Galeazzo's cause of death, we must at least know to take Burckhardt and Guicciardini's accounts with a dash of caution. 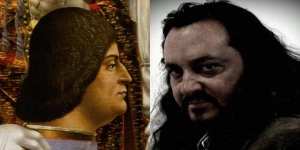 Is this controversial work a Sforza 'princess'? It was a shame we did not get a mention or glimpse of Leonardo, employed and living among the Sforza at this time. He even painted a (now restored) fresco at the Castello Sforzesco. Seeing Leonardo in Milan would have been a treat, and historically accurate. Hopefully he will appear in a subsequent episode. 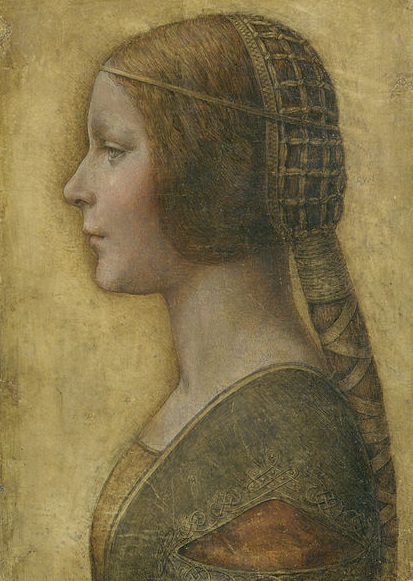 Interestingly, the alleged Leonardo piece that is at the centre of great debate among art scholars, La Bella Principessa, has been suggested by Oxford's Professor Martin Kemp as the daughter of Ludovico, Bianca Sforza. For more on this work, including an interview with Professor Kemp, visit this earlier post. This week was much more of a challenge. No large Fra Angelico or Uccello in the background like last week. The first point worth mentioning is at the very opening of the episode, with the Pope's guilt-ridden dream sequence that shows Lucrezia morph into a ceiling fresco. I have not been able to find a corresponding analogue for the ceiling depicted in this sequence. It does not resemble Pinturrichio's frescoes of the Borgia Apartments at the Vatican. It does in fact resemble some of Raphael's (later) work for the Stanza della Segnatura, where frescoes were cross hatched to give them the appearance of a mosaic. If anyone knows the work being depicted, or has an image of it, please let us know. The next reference was in the Florence sequence. We get the customary shot of Brunelleschi's dome as Cesare enters the city, but later as he plots with Machiavelli the two take a walk along the inside of the dome, as visitors do to this day on tours to the vantage point at the top. I was hoping the pair did get to the top to give us a glimpse of 15th Century Florence from above, but unfortunately this did not happen. Admittedly, it would have been an expensive job for digital artists to render this for a shot that would have lasted a few seconds at most. An amusing sequence involving suitors for Juan Borgia presented a painting of a 'Princess Silvia' from the Kingdom of Navarre - which was one of the smaller kingdoms on the Spanish landmass. I have tried to source any mention of 'Silvia' (or similar) in the Navarre line but have not found anything. 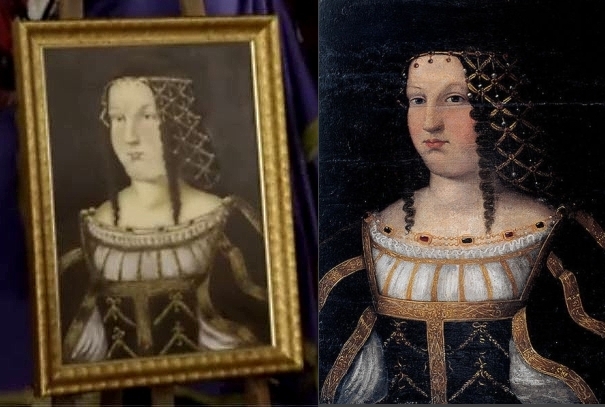 Interestingly, the portrait of this princess shown is much like a surviving portrait by an unknown artist, described as a copy of a Bartolomeo Veneto painting of Lucrezia that was completed between 1510-1520. The basis of the dates and source of this attribution have been difficult to ascertain. Della Rovere's fantastic voyage must surely collide with historical reality soon and we will see him travel to France to meet Charles VIII. Things are not looking good for Giovanni Sforza, and Cesare may still be distracted by other women for an episode or two until Lucrezia returns. Young Gioffre Borgia's new bride from Naples is also due to arrive. It would be great to see Leonardo pop up in a sequence alongside Ludovico. Savonarola is still menacing Florence, and has now come to the attention of Alexander. The bonfire of the vanities is still a few years away, so may not appear in this season. Fortunately, the show has just been confirmed for a second season, so we may get to see it after all. Don't know this version. There was an older 70s version with Oliver Cotton (Ceasare) and the guy who plays the villain in Thunderball as Roderigo. Adolfi Celi? It was really high camp, but great fun to watch. There are probably some clips up on YouTube. Hello David, I have indeed seen that! Also worth a watch is the 2006 Spanish mini-series, Los Borgia, which I may do a review of once this first season of the Showtime series finishes. For UK viewers such as yourself, you will be able to see The Borgias on cable TV starting July.